As a media company, building a sustainable digital business model relying on monthly subscriptions for a long time seemed like a fantasy. But as our chart shows, the New York Times, next to other national and international news media brands, gives proof to a concept which for many is the key to survival for independent journalism. 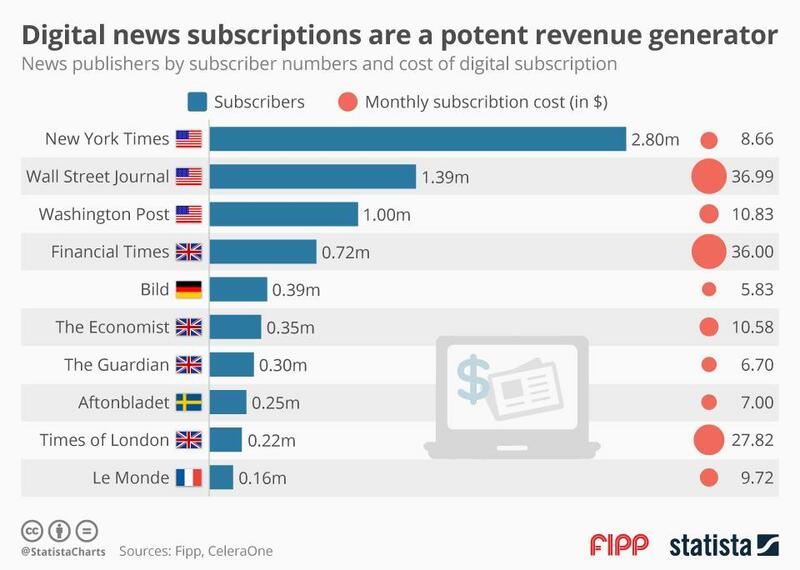 Whilst international English language newspapers like the New York Times or the the Wall Street Journal are topping the list subscriber-wise, the ranking shows that digital subscriptions also are a valid tool for national newspapers to generate revenue. Ranking fifth, Germany’s Bild boasts almost 400,000 subscribers - each paying the equivalent of US$5.83 per month. This week's chart comes from the first ever Global Digital Subscription Snapshot, a research study produced by FIPP and CeleraOne. Chart of the week: Is TV's reign nearing its end? [Sponsored] Despite the emergence of digital channels, print publishing has continued to thrive. In the US, the top 25 print magazines reach more adults and teens than the top 25 prime time shows. Reverse publishing is the sign of print's continued power.